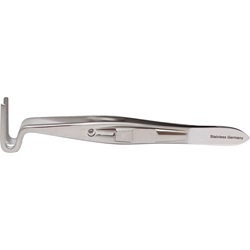 Berke Ptosis Forceps that have a curved tip with straight, longitudinal serrated blades. Available in 27mm or 20 mm jaw length. 20mm jaw length. Overall length: 98mm. 27mm jaw length. Overall length: 104mm.